Dundee City Council is moving ahead with development in electric vehicles by awarding the first phase of works estimated at £1.8m to SWARCO Group’s eMobility brand, Evolt. The project, which will aim to boost the number of plug-in cars on Scottish roads, will support three new charging ‘hubs’ in the city, along with an additional regional charging infrastructure. Evolt has now installed over 1,000 charge points in Scotland and has been selected to the Energy Saving Trust’s national framework to deliver public and private EV charging. As one of the Go Ultra Low Cities, Dundee is creating three new charging ‘hubs’ that will become dedicated areas for the charging of electric vehicles. Each hub will be equipped with Evolt’s charging technology, including a combination of Rapid and Fast charging units that can charge two EVs simultaneously to 80% battery life within 30 minutes and an hour respectively. To harness the benefits of renewable energy, each hub will have solar panels installed to feed Evolt’s energy storage solution, which harnesses the power of second life EV and hybrid battery packs. Storing energy for future use reduces the heavy demand placed on the power grid when EVs are charging simultaneously. A further four Rapid chargers and seven 14 Fast chargers will be installed at additional locations outside of the city centre to provide a network that supports existing EV users and to encourage further take-up. All of Evolt’s units will be connected to the national ChargePace Scotland network. Dundee is the first of the eight Go Ultra Low Cities to award a contract following the announcement of £40m of Government funding earlier this year. Evolt was successful with its bid following a competitive tender exercise, and is working with British Gas as its installation partner. 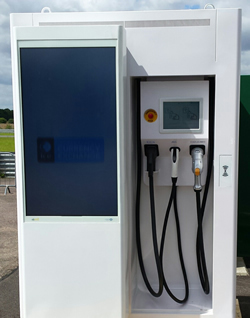 Among the 14 Rapid chargers delivered, Dundee has chosen six of Evolt’s next generation Raption 50 model that includes a 47“ LCD screen to offer the council a further revenue generating opportunity. The Raption 50 Rapid was unveiled in September at the Cenex-LCV exhibition, and this will be the first time the new units have been installed in the UK, with multiple units already installed across Europe. Evolt has supplied 24 of Scotland’s 32 local authorities, with its model for continued success based on the provision of highly reliable hardware combined with a strong and localised after sales service.